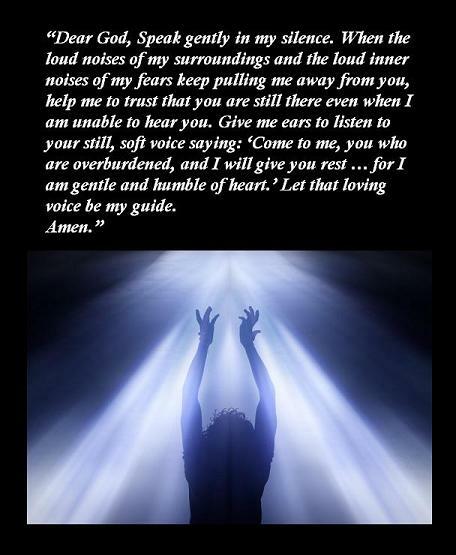 I can’t begin to count how many times this prayer and many more like it pass through my heart everyday. For myself, and for so many I lift up by name! I believe this is a huge “movement” in the Spirit of God right now. Teaching us to hear His voice, and fall in love with Him everyday as His Word confirms and reinforces that which He lovingly whispers into our hearts! A special Sister and I spoke of what a huge relief it is to know the God is so capable of leading, judging, and controlling EVERYTHING! Our media inundated world invites us to file so much off into “rights” and “wrongs” – “should’s” and “shouldn’t’s”…its almost hard to resist taking God’s “place” from within with our thoughts! So focused on what we do or don’t or if others should do or don’t the still small voice can get drowned out in the hum of cyber-space and television pixels. He must be persistent in moving us to discontent with it, or we will fall prey to that wolf in sheeps clothing! I must never fear, for God is able! He draws me near, and all is as it should be. Quite in His capable, and incredibly faithful loving Hands! The invitation to “Come away” is always given with the direction He’s headed – “Come, follow Me” Still waters, a table prepared with His body and blood, in His presence protected from our enemies, pastures of His peace and joy that’s yoked with His love! Oh, yes! Where He leads, I will follow!